Remove bacon from pan lay on paper towels, to drain fat. 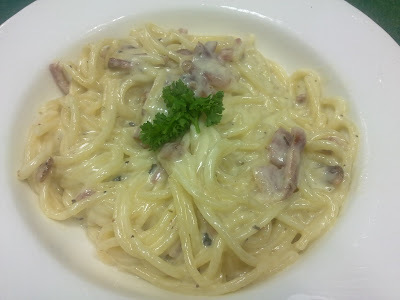 Drain spaghetti (or chosen pasta), put pasta back in your pasta bowl, pour sauce on top,toss with the eggs and carbonara sauce, then add the cooked bacon and chopped parsley. 0 Responses to "spaghetti carbonara"